Six months ago I wrote about my latest doctor visit and how I was going to get my cholesterol numbers down for my follow-up checkup in April. Well, that time has come. Unfortunately I don’t have any news to report. That’s not because I’m still waiting on results, but because I totally forgot about the appointment until the day before, when the doctor’s office called to remind me. I knew there was no way I could have them check my cholesterol. I knew my results would be high and this time it was Tammy’s fault. Yeah, that’s right… Tammy’s fault. We recently celebrated our 10-year anniversary and Tammy made me a huge tray of homemade (as in she made from scratch) peach cobbler. 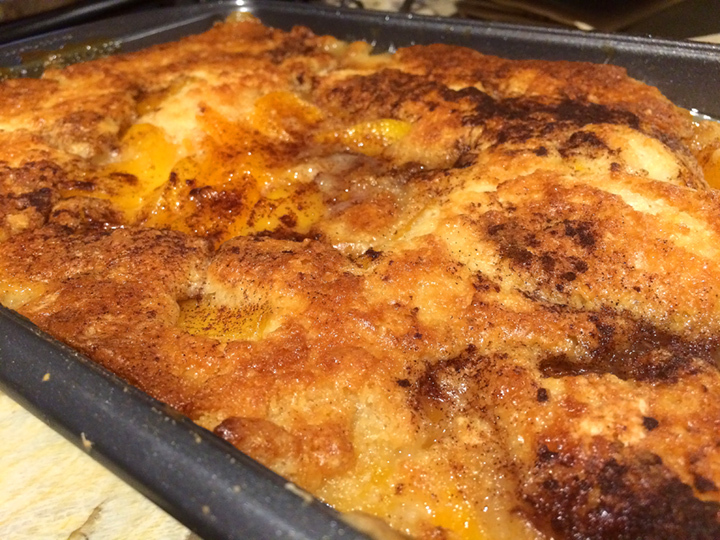 My love for peach cobbler, combined with the fact that Tammy never rarely makes things from scratch meant any work I had done the previous 6 months would be rendered meaningless. Truth be told, the only change I had really made during the previous 6 months was taking the Red Yeast Rice pills like the doctor suggested. Despite Instagram and Facebook pictures to the contrary, I don’t eat terrible, but I knew the pills alone wouldn’t get the numbers down significantly. 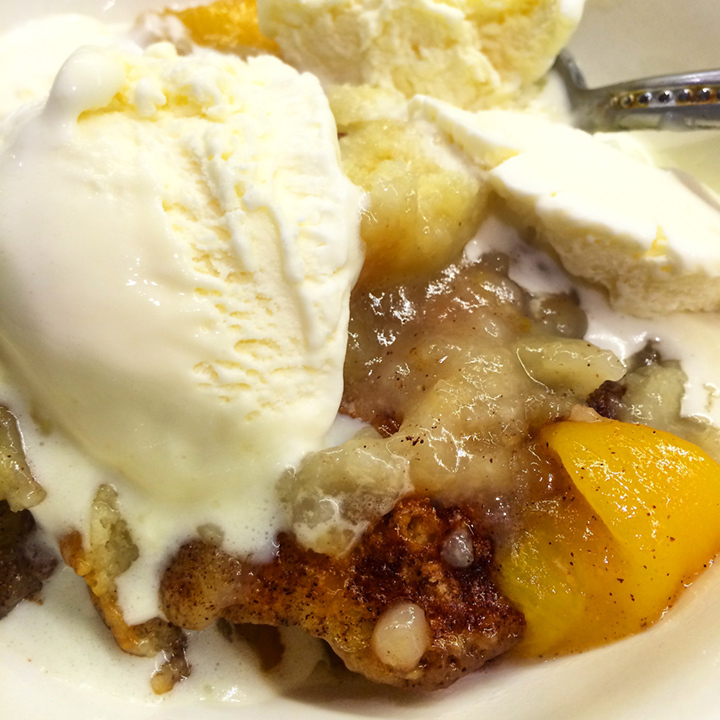 But throwing down bowl after bowl of that delicious peach cobbler, covered with ice cream, meant I had ZERO shot at succeeding. So, instead of risking bad test results that could have most likely would have resulted in being put on cholesterol medicine, I intentionally sabotaged myself. To get a more accurate cholesterol result you are sposed to fast for at least 12 hours before the test, so since my appointment was at 8:30 I decided to “accidentally” eat breakfast and have some coffee that morning. I was all “Oops” as I scarfed down my egg whites with turkey sausage and mushrooms. Then I played dumb when the doctor asked if I had eaten during the past 12 hours. Me: I totally forgot to do that. I could tell by the look on his face that he wasn’t happy with me, but at that point there wasn’t anything he could do about it. So now my next appointment is scheduled for July 14th and I put a big reminder on my calendar. My visit did result in having to check my blood pressure on a regular basis for the next month. I blew a 140/90, with a pulse rate of 100, during my visit and it raised some alarms for the doctor, not so much for me. My pulse rate has always been high and I know some of it is a result of medicine I take. My blood pressure has never been high during any of my visits (my last visit was 122/80) and if it was borderline the nurse would always check it again 5-10 minutes later and it would be way down. They always called it “White Coat Syndrome” and never worried since it always went significantly down on the second test. As he was telling me how he wanted me to monitor my BP for a month, I reminded him that it hadn’t been high before. It didn’t matter, so now I’m checking it from home twice a day, once at 7 a.m. and again at 7 p.m. So far the highest I’ve blown was a 136/86 with 123/83 being the lowest. By no means are those great numbers, but they are better the results in his office. Of course Tammy had to get her blood pressure checked. She started out standing before I told her to sit, was singing along to The Voice before I told her she had to be quiet. Oh, and had just finished dancing/exercising. She blew a 110/67 with a pulse rate of 74. Me: Get away from me. Tammy: What? Is that good? Me: It’s better than mine and your pulse rate… it’s like you are barely alive. Tammy: And I just exercised. No wonder I’m so tired all the time. Me: Yeah, because your blood is barely moving through your body. Tammy: Will it make you feel better if my cholesterol is higher? Tammy: As long as you are closer to death than me then it’s fine? Tammy: What? So you want me to be ahead of you? Me: No. I want us to be at the same rate close to death. We looked it up and of course her blood pressure was perfect. Me: You can never get your blood pressure checked again. So now I’m going to put a more focused effort together to get my cholesterol and blood pressure down by July. Gallery | This entry was posted in Daily Life and tagged daily life, family, fitness, health, humor, life, Tammy, wellness. Bookmark the permalink. Maybe a step back from that Memphis bucket list?